Apportal v2.0 is coming out soon, eh? Apportal 1.0 is a datatable that offers quantitative data about Canada's top english universities and their undergraduate programs. The datatable is equipped with easy to use sorting and filtering features. The criteria includes tuition+fees, minimum admission grade, required courses and TOEFL/IELTS minimums (for international applicants). 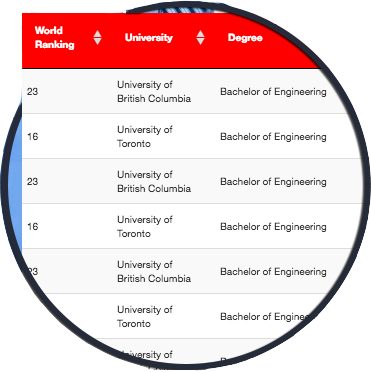 The list of universities that are included in our datatable are within the top 22 ranked universities in Canada according to the QS World University Rankings.